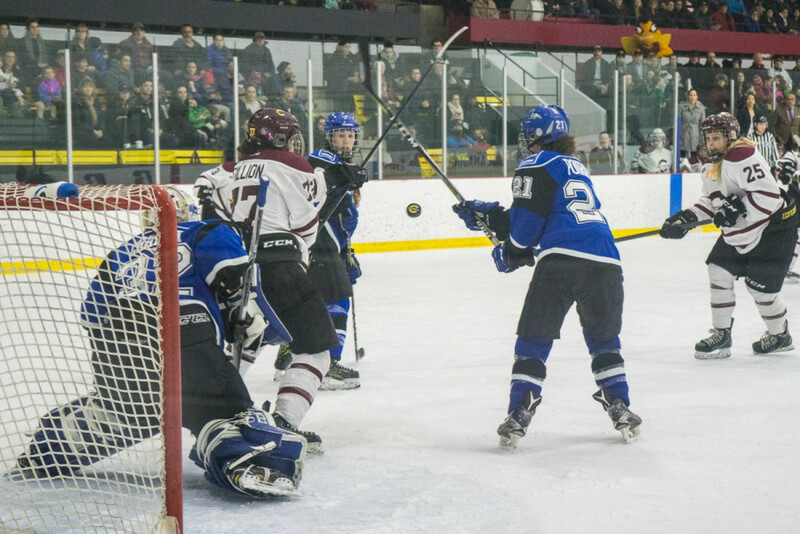 Chu said they needed to sharpen up defensively against a team that had averaged three goals per game during the regular season and could sweep the series. By the time game two rolled around on Saturday, it appeared as though both teams got the message with only ten shots total being taken throughout the whole first period. It was a tense game and it seemed as though the first mistake would blow the whole game open. 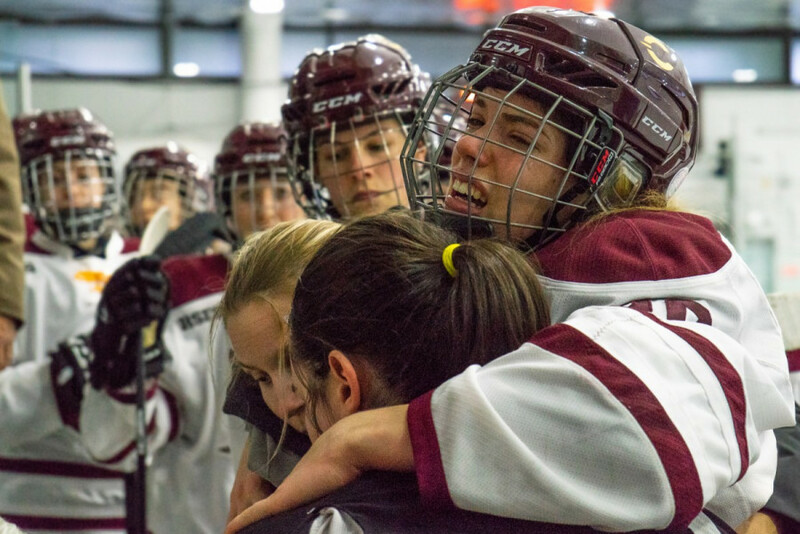 That mistake came with only three minutes left in the period when a defensive mishap lead to Stingers forward Audrey Belzile finding Stéphanie Lalancette all alone in front of the net and burying it. As the period wound down, the same tense and defensive hockey was being played, but a feeling like this game was about to open up considerably. As the second period started, that is exactly what happened. Concordia wasted no time pinning Montréal in their zone with several minutes of intense forechecking. The pressure payed off 2:40 in as Brigitte Laganière fired a rocket into the top corner to double the Stingers’ lead. This was also the first game back for veteran goaltender Katherine Purchase, who missed two games with an undisclosed injury. Her presence was not only felt on the ice, but in the locker room as well. 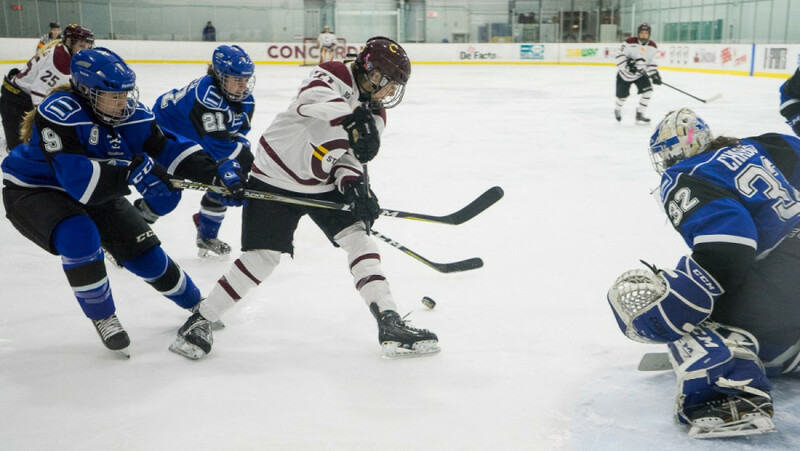 As the Stingers continued to pile on the pressure, they managed to get two power plays in a row and a chance to put the game nearly out of reach. 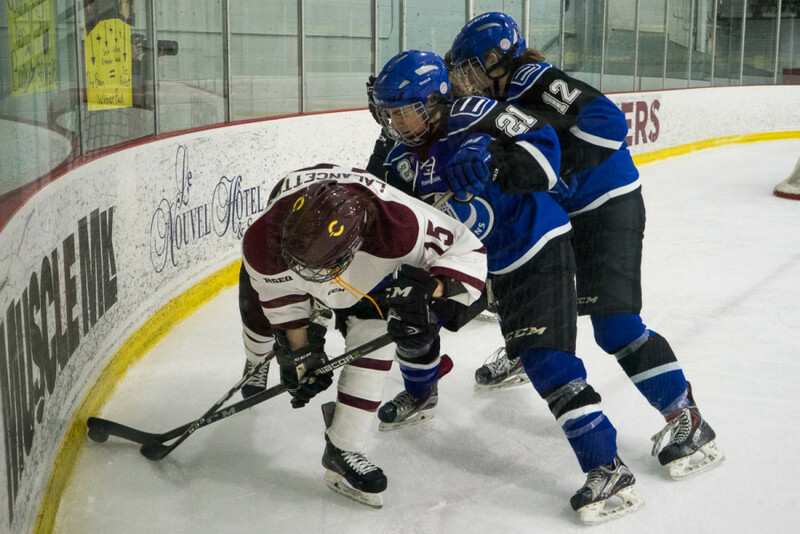 However, a slip up in the offensive zone saw Carabins forward Annie Germain go in all alone shorthanded and reduced Concordia’s to 2-1. Following the goal, the Stingers doubled down on a high pressure forecheck and pinned Montréal back in their zone for the majority of the period. The pressure finally paid of as captain Marie-Joëlle Allard fired home a power play goal to reclaim their two goal lead. The Carabins did manage to make it interesting in the third as a beautiful passing play gave Montréal forward Jessica Cormier a wide open net to pull Montréal to 3-2 with fifteen minutes left. After that goal, however, the Stingers’ defense was lights out. Following the game, Chu was also pleased with the outcome, especially since this is the first game in seven meetings that the game did not go into overtime or a shootout. While everyone was happy with the result, the game was not without its share of bad news. Halfway through the third period, Lalancette crashed into the boards hard and was in considerable pain. She was helped off without being able to put any pressure on her leg and did not return to the game. The Stingers will have to push past being short a defender as they look to win the Réseau du sport étudiant du Québec title in a decisive game three on Sunday at the CEPSUM.